What Happens When a Hurricane Occurs? 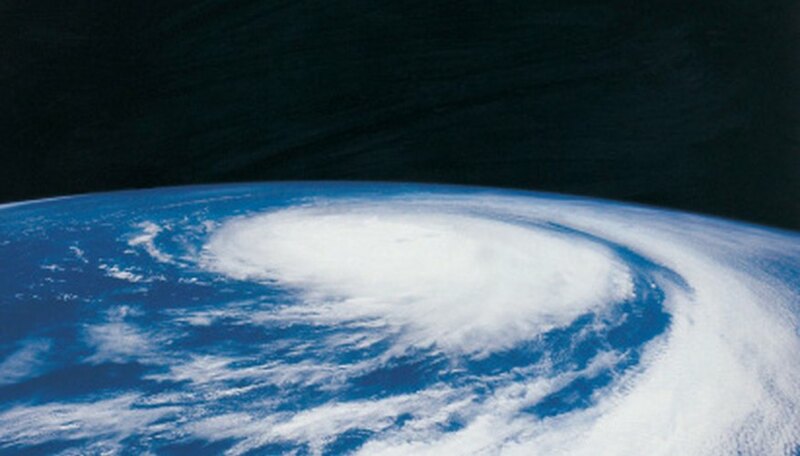 The word "hurricane" describes a severe tropical cyclone in the North Atlantic Ocean, the northeast Pacific Ocean or the eastern South Pacific. Hurricanes are characterized by high winds and strong waves, known as a storm surge. When a hurricane reaches land, the storm surge can destroy buildings and upend cars. There are several stages involved in the formation of a hurricane. It usually takes a few days for a hurricane to develop, though the temperature of the sea and wind conditions can mean it takes longer. The first stage of a hurricane's development is the formation of a tropical wave, which features multidirectional winds that blow from east to west at about 25 miles per hour. The second stage of a hurricane's development is the formation of a tropical disturbance, manifested as a cluster of thunderstorms 100 to 300 miles in diameter. A tropical disturbance typically begins in a tropical or subtropical area, and it will last for at least 24 hours. It is characterized by significant rainfall and wind. A tropical disturbance makes a transition into the third stage, which is a tropical depression, a low-pressure system with continuous winds of 38 mph, and severe thunderstorms. In the fourth stage of a hurricane's development, a tropical storm forms with surface wind speeds of 40 mph to 70 mph. At this stage, the storm has a closed circulation, which means winds are blowing in a counterclockwise direction with a low-pressure center. The manifestation of a tropical storm is often a strong indication that a hurricane might strike a certain area, and at this point, the National Hurricane Center will usually assign a name to the storm. Tropical storms become hurricanes when winds surpass 75 mph and an "eye" forms at the center of the storm, with warm temperatures and strong winds. Hurricanes are classified into five categories measured on a system known as the Saffir-Simpson scale. Category one hurricanes feature winds of 74 mph to 95 mph, category two hurricanes have winds of 96 mph to 110 mph, category three have winds of 111 mph to 130 mph, category four winds are 131 mph to 155 mph, and category five winds are 156 mph and greater. Category one hurricanes generally cause minimal damage, whereas category five hurricanes are catastrophic, with high risk of injury and death, and significant destruction of property. Quain, Sampson. "What Are the Stages of Development of a Hurricane?" Sciencing, https://sciencing.com/stages-development-hurricane-8516910.html. 25 August 2017.